Units in these situations are called "split systems". All the units we retail have been accredited for use in homes in all states within Australia. Which unit that can be used will depend on the clearance that is available under the floor and the number of people that will be using the toilet. The Classic range begins where there is more than 450mm gap under the floor. These units are simple to install and are very effective. Excess fluids will run to a small trench. The Sun-mar Centrex range requires about 1100mm under the floor. There are various options available, in units using 240volt power the liquids can be evaporated off if necessary, eliminating the need for a trench. There are also ultra low flush models which enable the pedestal to not be directly above the unit and for more than one pedestal to be used. If you’re investigating the option of composting waterless toilet systems, Clivus Multrum is one of the easiest and affordable ways to turn your bathroom into an environment that gathers waste and turns it into usable compost. See the full range or Learn how it works. 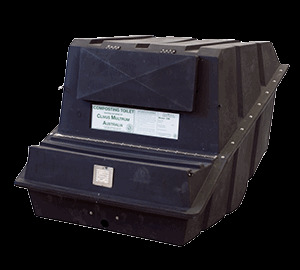 © EnviroPro Alternatives Pty Ltd. All Rights Reserved.